The farm Il Colle del Gusto was born as a company fully oriented to agriculture for self-consumption, and only later developed for the sale of its products. 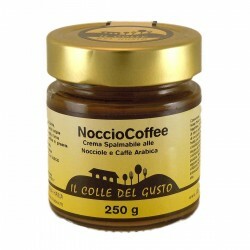 The production is 'typical of the countryside of Lazio, and it is known for the production of Spreadable creams with hazelnuts, cocoa and Extra Virgin Olive Oil. Also won the American taste Sofi Awards winning the prize with the cream spreadable "Pistacchiosa", a sweet cream made with pistachio and with high quality extra virgin olive oil of the Sabina.